APPLE iPod Classic 5th Generation Black 30 GB Model #A1136. Comes with the case shown and cord. Does work immaculately when plugged in. Seems to shut off once unplugged. Photos show all any questions just ask thanks. Apple iPod classic 5th Generation (30 GB) 30GB used. Condition is Used. The iPod has been reset to factory defaults and is ready to go. 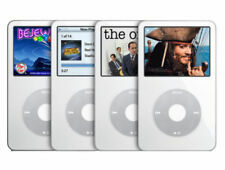 Apple i pod 30 GB, 5th generation, MP3 player. Ipod has many songs downloaded. Heavily scratched on the back. Up for sale, a white iPod classic, 30 GB of storage. This item is in excellent working condition. 5.5 Generation Enhanced Video Classic (Black). Model MA446LL Series A1136. PROFESSIONALLY SERVICED, TESTED, REFURBISHED. ACTUAL IPOD PICTURED. Clean, Looking Good, Working Perfect iPod. SUPERIOR AUDIO QUALITY. 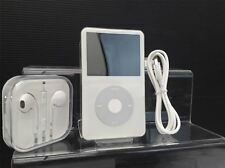 Apple iPod classic 5th Generation White (30 GB). Condition is Used. Shipped with USPS First Class Package. CUSTOM Apple Ipod Classic 30gb 5th generation - WORKS GREAT! FREE SHIPPING! I have lowered the price. I am very surprised this iPod Classic is still available. You will not find a nicer iPod for the price. As you can see in the pics it is showing a bit of wear. Nothing major. APPLE IPOD CLASSIC 5TH GENERATION - 30GB - BLACK. We will do our best to make it right! Used, 100% tested, fully functional. Front: Heavy scratches. Apple Ipod 5th Generation with Video capability, 30 GB. Still in good working condition. Has scratches. Apple A1136 iPod Classic 5th Gen, Black, 30GB, Tested, Good Battery, Scratches. Factory reset. iPod has scratches and wear all over the front, but no damage to screen or dents. Wear is light and does not interfere with visibility of the device when in use. iPod was purchased from a previous owner who has monogrammed the back of the case. Lot includes two cases, two charging cables, ear phones and two sleeves. Condition is Used. Shipped with USPS First Class Package. Apple iPod classic 5th Generation Black (30 GB) back is scratched a bit. Apple iPod classic 5th Generation Black (30 GB). Condition is Used. Shipped with USPS First Class Package. 4.5 out of 5 stars - Apple iPod classic 5th Generation Black (30 GB) back is scratched a bit. 1,069 product ratings1,069 product ratings - Apple iPod classic 5th Generation Black (30 GB) back is scratched a bit. Shipped with USPS First Class Package. iPod restored in itunes, tested with tunes in excellent working condition, good battery holds charge, has normal signs of use, please see pics for details. No accessories included. This is for the iPod, and a charging cable. The iPod is in perfect working condition. The iPod only shows typical signs of use. Used Black 30GB Ipod. Front has scratches and scuffs. Back has a lot of wear and a sticker on it. Apple iPod classic 5th Generation Black (30 GB). Condition is Used. Apple iPod 30GB. Works perfectly. Apple iPod Classic 5th Generation A1136 30GB MP3 Player Working Scratched Used. Condition is Used. Has big scratches on corners see pictures and back is also scratched hard to read the writing on back works great test and charges great no weak battery comes with charger Shipped with USPS First Class Package. Very clean and works great. No cable or headphones. 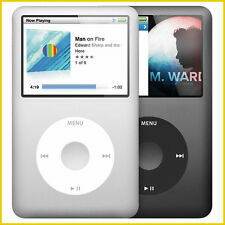 Black ipod classic 30gb used. Condition is Used. Shipped with USPS First Class Package.